Budon ensimmäinen opetus on kunnioitus, myötätunto ja kiitollisuus. Joka kerta kun kumarrat, sisäistät kunkin näitä sanoista. Osoitat kunnioitusta senioreita ja myötätuntoa junioreita kohtaan koska tiedät, mitä he ovat vuosien mittaan käyneet läpi, koska sinäkin olet kokenut samat asiat. Osoitat kiitollisuutta isänmaallesi eli yhteiskunnalle jossa elät, vanhemmillesi, jotka antoivat sinulle elämän, ja ystävillesi, jotka ovat tukenasi joka päivä menestyksen ja epäonnistumisen hetkinä. Lopuksi osoitat kunnioitusta Jumalaa kohtaan, koska Hän päättää mitä sinulle tapahtuu. A student of Matsumura Sokon and Kohai of Itosu Anko. Nicknamed "The Sergeant", he in fact was awarded a battlefield promotion to Lieutenant in the Imperial Army, a very unusual achievement for an Okinawan. 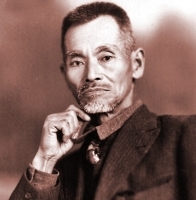 He is perhaps best remembered for his fight with the notorious Motobu Choki. This is reported to be the only time that Motobu was ever defeated. It was during a stay over in Hawaii (to visit family) that Yabu Sensei introduced and taught Karate at the local YMCA. It was there that Sensei Richard Kim had his first introduction to the art. Yabu's favourite kata was reported to be Useishi/Gojushiho, the Yabu version of this is preserved by Sensei Kim. Some notable students of Yabu Sensei were :- Makoto Gima, Richard Kim and Kanken Toyama. As we are a Kata based tradition, it is imperative that all students and teachers continue to research and develop the integration of the San ku principles in their training. O'Sensei Kim told me that "each Kata is a battle"... whether the battle be external or internal matters not, what matters is that we face the challenge and "win" the battle! "Kata are not some kind of beautiful competitive dance, but a grand martial art of self-defense which determines life and death.."
A martial tradition, a cultural tradition, an historical tradition. Kata in one form or other have always been the medium by which martial traditions have been passed down through the ages. If we examine our own tradition of Okinawan-Japanese heritage Kata, we are faced with a plethora of choices! In order to rationalize and structure our training and maximize the benefit to the practitioner, we have to first identify the "core" Kata - or, "representative Fighting Kata" as O'Sensei termed them and the "derivative" kata! These core Kata are relatively few in number (as fully explained during the autumn camp) with Oyadomari Patsai and Sanchin having already been covered "in depth". The next kata to be covered (ie. an intensive examination of their principles and practices), will be Seisan (Tomari) and Chatan Yara Kushanku. It is essential that all Yudansha and Sempai avail themselves of these opportunities to further their own knowledge and abilities. My purpose in establishing the Renmei was to repay the trust placed in me by my teachers. This includes not only the techniques but more importantly the principles and ethics required to enable each practitioner to incorporate this concept of "self-protection in daily life" to meet their individual needs. The Renmei is a concept and an ethic... With the only pre-requisite for participation being that students are required to actively participate by showing correct attitude and commitment. This approach is continued by the senior teachers of the Renmei, Senseis Mika, Tapio and Mira, who give their time and energy to assist the students with their development. As 2009 draws to a close it is time for each student to reflect upon their personal progress and to renew their commitment to the training (San ku - training Mind, Body and Spirit), you owe this not only to your teachers but also to yourselves. It is with regret and sorrow that we have to inform you all of the passing of Grandmaster Hidetaka Nishiyama who passed away on November 7th 2008, the same date as O'Sensei Richard Kim (17. Nov. 1917- 07. Nov. 2001) O'Sensei Kim had the highest respect and admiration for Grandmaster Nishiyama who he described as "A True Samurai", a man of honour, integrity and unsurpassed technical and teaching ability. 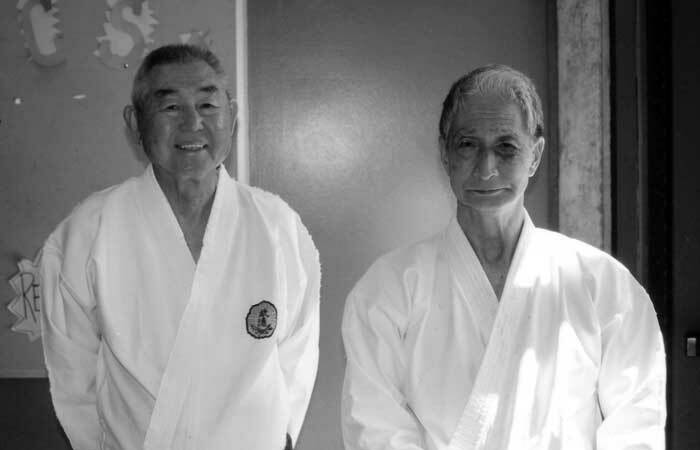 Our thoughts and prayers are with Grandmaster Nishiyama's family, friends and students. Hidetaka Nishiyama (10. Oct. 1928 - 07. Nov. 2008). Muistan joskus 60-luvun alussa (aivan oikein, Mira, 1860-luvun) keskustelleeni Denin, Steven ja Sandyn kanssa Kanazawa Senseistä, joka siihen aikaan asui Liverpoolissa. Muistan aina Kanazawa Sensein sanat: "Muista miksi aloitit (harjoittelun) ja mitä halusit (saavuttaa)". Nyt - monta vuotta myöhemmin - muistan hyvin monia oppilaita, joille harjoittelu on antanut hyvin paljon, mutta jotka ovat syystä tai toisesta pettäneet itsensä jättämällä toteuttamatta alkuperäisen sitoumuksensa täyttääkseen oman potentiaalinsa. Sitoutuminen merkitsee lojaalisuuden, velvollisuuden tai lupauksen osoittamista jollekin asialle tai henkilölle...tärkein sitoumus jonka voimme tehdä tapahtuu itsellemme ja sen kautta voimme sitoutua niihin ihmisiin, jotka ovat meille tärkeitä. Älä luovu unelmistasi äläkä koskaan, koskaan anna periksi. Tätä polkua seuraamalla olet aina voittaja! Purpose: direct application of the principles and response patterns inherent in the ZONE or "FENCE" concept of personal protection. Stance is variable, ranging from Sanchin thru Seisan depending upon proximity and degree of contact (ie. no contact-to touch contact-to push contact-to grabbing-to grappling). It is therefore essential to establish correct structure to enable the correct development of the principles of "grounding" so essential in any CQC conflict situational response, whether dealing with emotional, verbal and or physical aggression (or any combination of these). Having achieved this, particular emphasis must then be placed on the YIN-YANG physical and mental conditioning, by the incorporation of the "Fa Jing" principles covered at the last Camp. These subjects will be covered in greater detail at the next Instructor's course, in addition to the Ni and San variations. There is an ebb and flow to nature's rhythm that is universal and affects all life. This is essential for survival. Only human society ignores (or attempts to ignore) this with the result that we subjugate our bio-rhythm to clocks, artificial light and a work/living environment designed to "free" us from natures influence (interference)! This has now been worsened by the fact we have to deal with, work with and in a sense "live" in cyberspace!!! Small wonder that although people are living longer the ills of modern society both physical and mental are manifesting themselves more and more with all age groups! Self-protection skills must incorporate this aspect, remember whenever you perform your meditation, go thru your Qi gong, Tai ji, Kata etc., you are in a time and space of your own creating, please maximize the benefit of this!!!! We must TAKE the time each day to recognize and connect with our own bio-rhythm(s) and that of the natural world around us.